I was in a nostalgic mood. That's all I can say. Having the flashy and fun "newer" games is always a treat. However, there are times I am looking for some good-old fashioned nostalgia to fill in my collection. A game that will, more than likely, be a keeper if I can find the right one because it swells with so many memories I could never let go. Well, Earthshaker was one on my "must own / nostalgia" list. And, I found the right one. 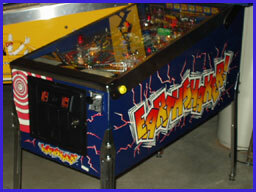 A collector friend of mine, Bruce Nightingale from Rochester, NY, relayed to me that he had a really nice Earthshaker. He was looking to sell it. After seeing pics of the game, I knew I had to have it. 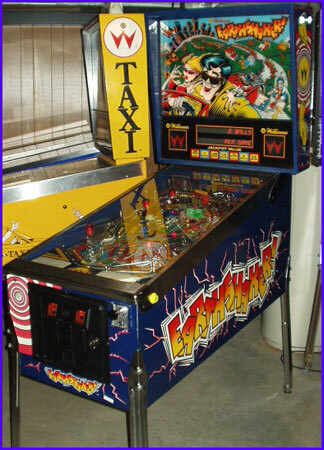 Not only was the playfield and backglass in great shape for its age, but the cabinet was spectacular with really no fading and very little wear. January 8, 2005, Bruce came down and brought the game along with him. I love it and it'll probably remain a keeper.